My report is available FREE to all hotel owners and managers. 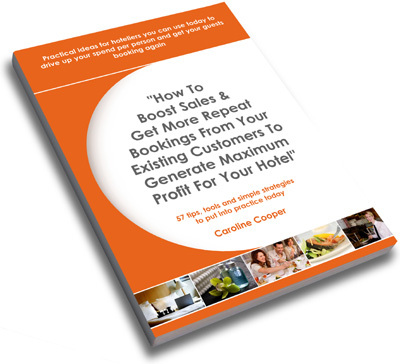 I’ve written my this report to give you real, practical tips to get your sales up from day one. There are no complicated gimmicks or hard to follow instructions, just actions that work. 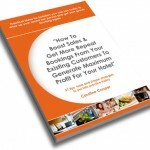 How to drive your existing and potential customers back to you - time and again. Why you need to become an expert in your chosen field. How to increase customers' spend per head and increase the lifetime value of every customer. Why you need to collaborate with suppliers, local businesses and even your competitors for a win - win. How to increase your customers perception of value for money without reducing your prices. How to ensure your staff are contributing to - not hindering - your efforts to increase margins. All this advice and more is included in my report which you can request FREE today. When you enter your details above you will be asked to confirm your request by replying to our e-mail. You will then have immediate access to Caroline's FREE report. Because we respect your privacy your details will never be given to any third party and you can unsubscribe at any time. If you are serious about increasing the profit you make from your hotel you should request my report today, so you don’t miss out on a single opportunity to make more sales and get more bookings. PS. The guide is entirely FREE — all you need to do is fill in this form and we'll send it to you.